After a summer full of family fun, you would think my kids would show their undying gratitude for all of the amazing experiences made possible thanks to my husband and I. From an afternoon at the Canadian Warplane Heritage Museum and a day at Canada's Wonderland to a trip to Ripley's Aquarium and not one, but two afternoons at Medieval Times, we managed to sneak in lots of memorable outings. And this doesn't include our last-minute weekend getaway up north or our staycation at the Eaton Chelsea hotel. So can someone please tell me why, oh why do my darling children manage to drive me up the wall with their constant bickering and arguing? Can't they just get along, for crying out loud? It was the least I could do to salvage my sanity by taking up an offer to escape get out of the house and try out some real wall climbing. You know, the kind that requires special safety gear while dangling 20 feet above ground amidst the peace and quiet of Mother Nature's backyard. The extent of my wall climbing experience to date can be summed up by a handful of attempts on a mobile wall-climbing apparatus with conveniently placed grips to guide your way to the top. My first attempt was nearly 12 years ago and it was an adequate intro to the sport. But it left me wanting a more difficult challenge, a true outdoor climbing experience that would require strength of mind and body. 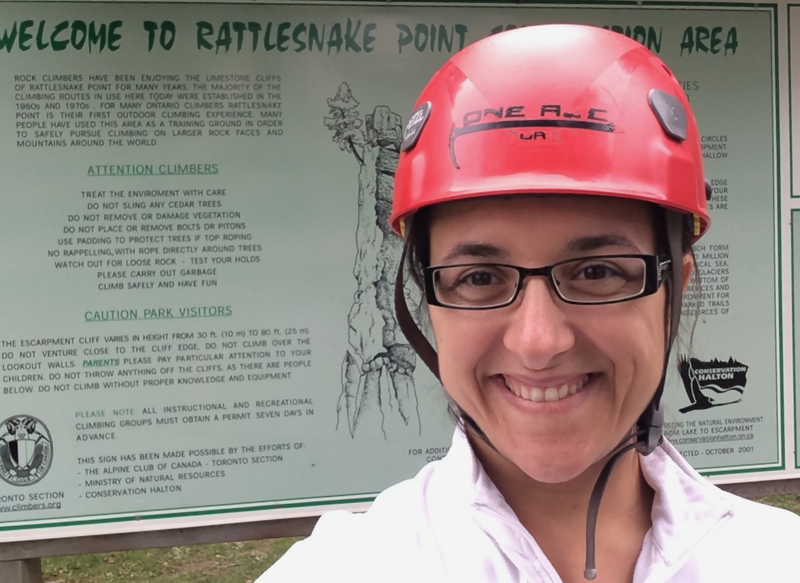 And so I made the hour-long trek to the limestone cliffs of Halton's Rattlesnake Point where I had participated in the 5 Peaks Trail Race earlier this summer. It was here that I could finally cross one off my bucket list. 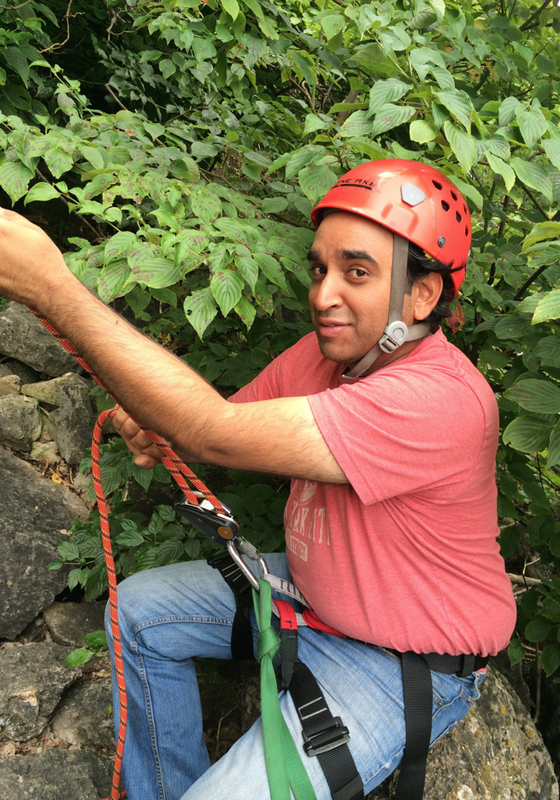 My fear of heights would have to take a back seat as I learned how to properly knot my ropes and how to belay from a wall climbing expert from One Axe Pursuits. 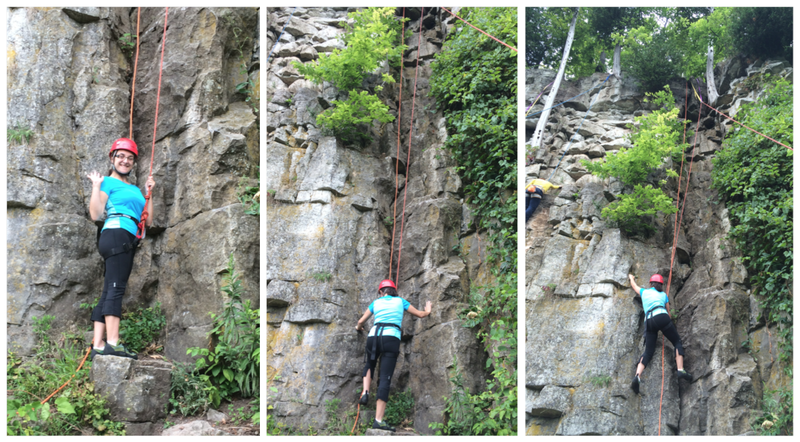 With Jay from Mississauga Life as my climbing partner, I took on the four easier courses without too much difficulty. Thanks for not letting me plummet to my death, Jay! These first four courses had their own little challenges but we were welcome to attempt them more than once to find different or easier routes. 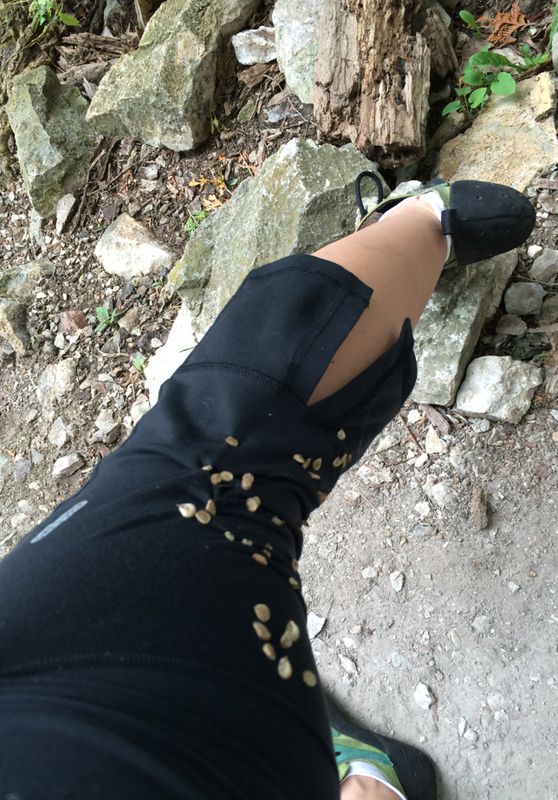 After about 100 burs, a minor scratch and ten minutes later, I decided to hang up my helmet and call it a day. 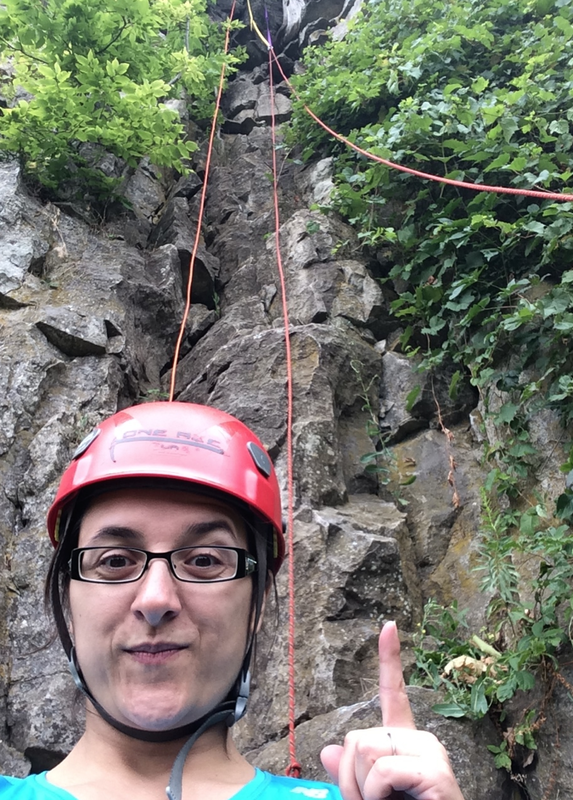 The good thing about the entire experience was that I was able to gain a better understanding of safety protocol, knot-tying and belaying technique as well as conquer my fear of heights in the midst of the beautiful outdoors. It was more than just a physical challenge and the sense of accomplishment was the ultimate reward. Our guide was very thorough in his instructions and made sure everyone participated safely. Also, don't forget to check out the 2014 Red, White & True Canadian Heritage Passport to save over $400 on incredible Canadian experiences. Who knows? You might find something that will help you save your own sanity. 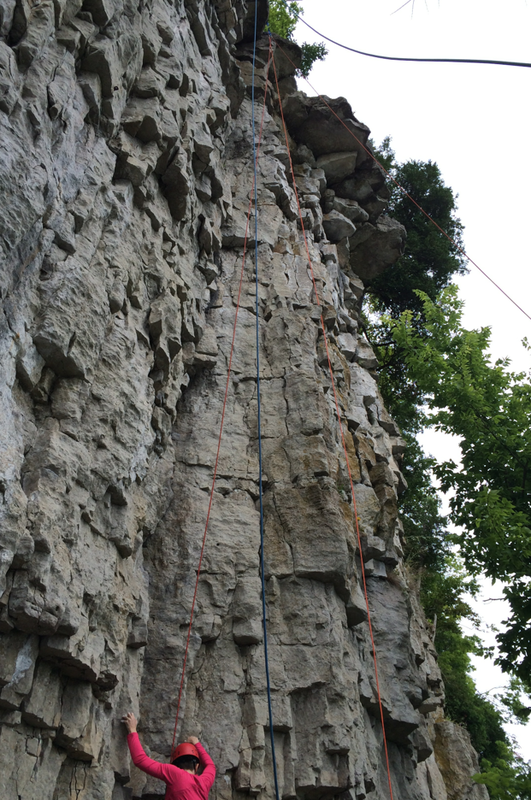 Disclosure: This post, which highlights just one of many outdoor experiences in Hamilton Halton Brant, was facilitated by a complimentary experience. Any opinions expressed in this post are my own. Wowza. I would love to try that!! Crazy challenging. It sure was a challenge but it was a lot of fun. Tom Cruise/Ethan Hunt - Eat your heart out! You are my new hero! lol I've always wanted to do this! 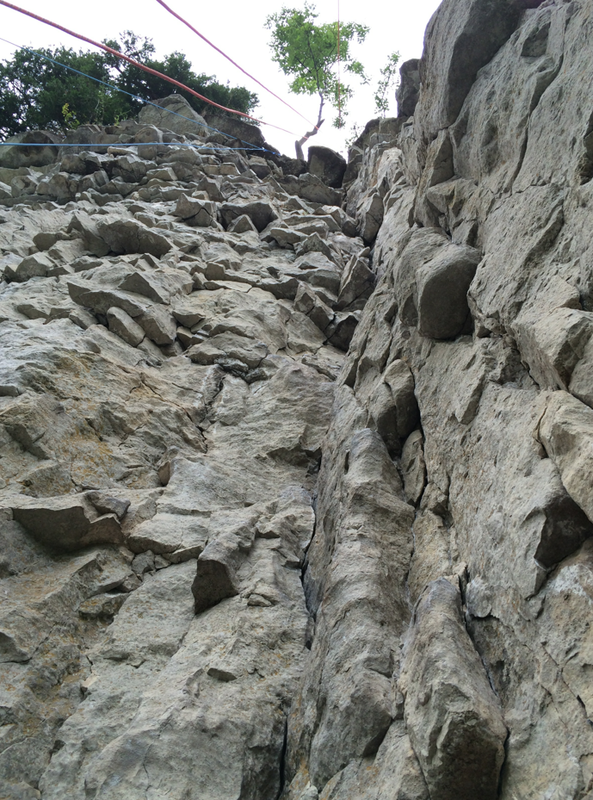 Thanks for sharing, it sounds like you learned alot about yourself and climbing! Thanks, Anne! If you do end up trying it, I'd love to know how it goes. Cheers! that looked like it was so straight up, I wouldnt be able to do it. Oh I would SO do this! Looks and sounds like it as awesome! This looks like fun, although I don't think I could do this!!! Wow!! This looks like a lot of fun!! Do you mind if I add it to my Bucket List?? Thanks for the post!! OK...you are braver than me. My fear of heights would not allow me to even think about trying this. Wow! That looks like a lot of fun! Maybe I'll try this one day!! Kids love adventures...and their parents love to watch them. When my boys are old enough, I'm bringing them here. This looks like such a thrill! I will definitely check out One Axe Pursuits. Looks like so much fun and for profi. wow looks like a great place , i don't think i could force myself to do that , your braver than i :) Treen Goodwin rafflecopter name !